The Things They Carried author Tim O’Brien is a co-writer on NBC’s hit show THIS IS US for episodes about Jack’s time in Vietnam. "O'Brien succeeds as well as any writer in conveying the free-fall sensation of fear and the surrealism of combat." "The best of these stories--and none is written with less than the sharp edge of honed vision--are memory and prophecy. These tell us not where we were but where we are, and perhaps where we will be. . . . It is an ultimate, indelible image of war in our time, and in time to come"
"The Things They Carried is as good as any piece of literature can get . . . It is controlled and wild, deep and tough, perceptive and shrewd." "In prose that combines the sharp, unsentimental rhythms of Hemingway with gentler, more lyrical descriptions, Mr. O'Brien gives the reader a shockingly visceral sense of what it felt like to tramp through a booby-trapped jungle, carrying 20 pounds of supplies, 14 pounds of ammunition, along with radios, machine guns, assault rifles and grenades. . . . With 'The Things They Carried, Mr. O'Brien has written a vital, important book--a book that matters not only to the reader interested in Vietnam, but to anyone interested in the craft of writing as well." "[B]elongs high on the list of best fiction about any war....crystallizes the Vietnam experience for everyone [and] exposes the nature of all war stories." --New York Times, "Books of the Century"
"With The Things They Carried, Tim O'Brien adds his second title to the short list of essential fiction about Vietnam. . . . [H]e captures the war's pulsating rhythms and nerve-racking dangers. But he goes much further. By moving beyond the horror of the fighting to examine with sensitivity and insight the nature of courage and fear, by questioning the role that imagination plays in helping to form our memories and our own versions of truth, he places The Things They Carried high up on the list of best fiction about any war." "When Going After Cacciato appeared out of nowhere to win the 1979 National Book Award, it seemed to many, myself included, that no finer fiction had, as of then, been written in the closing half of the 20th century--or was likely to be in the remaining years to come. The Things They Carried disposes of that prediction. . . . Tim O'Brien is the best American writer of his generation." "Rendered with an evocative, quiet precision, not equaled in the imaginitive literature of the American war in Vietnam. It is as though a Thucydides had descended from grand politique and strategy to calm dissection of the quotidian efforts of war. . . . O'Brien has it just right." "Powerful . . . Composed in the same lean, vigorous style as his earlier books, The Things They Carried adds up to a captivating account of the experiences of an infantry company in Vietnam. . . . Evocative and haunting, the raw force of confession." "O'Brien has written a book so searing and immediate you can almost hear the choppers in the background. Drenched in irony and purple-haze napalm, the Vietnam narrative has almost been forced to produce a new kind of war literature. The Things They Carried is an extraordinary contribution to that class of fiction. . . . O'Brien's passion and memory may have been his torment all these years, but they have also been his gift. . . . The Things They Carried leaves third-degree burns. Between its rhythmic brilliance and its exquisite rendering of memory--the slant of sunlight in the midst of war, the look on a man's face as he steps on a mine--this is prose headed for the nerve center of what was Vietnam." "Simply marvelous ... A striking sequence of stories that twist and turn and bounce off each other . . . O'Brien has invented a tone of voice precisely suited to this war: it conveys a risky load of sentiment kept in check by both a chaste prose and a fair amount of comedy. . . . Wars seldom produce good short stories, but two or three of these seem as good as any short stories written about any war. . . . Immensely affecting." "The Things They Carried is as good as any piece of literature can get. . . . The line between fiction and fact is beautifully, permanently blurred. It is the perfect approach to this sort of material, and O'Brien does it with vast skill and grace. ... It is controlled and wild, deep and tough, perceptive and shrewd. I salute the man who wrote it." "Consummate artistry ... A strongly unified book, a series of glimpses, through different facets, of a single, mysterious, deadly stone . . . O'Brien blends diverse incidents, voices, and genres, indelibly rendering the nightmarish impact of the Vietnam experience." "O'Brien has brought us another remarkable piece of work . . . The stories have a specificity of observed physical detail that makes them seem a model of the realist's art. . . . What finally distinguishes The Things They Carried is O'Brien's understanding of the nature of memory." "This is writing so powerful that it steals your breath. ... It perfectly captures the moral confusion that is the legacy of the Vietnam War. . . . The Things They Carried is about more than war, of course. It is about the human heart and emotional baggage and loyalty and love. It is about the difference between 'truth' and 'reality.' It is about death--and life. It is successful on every level." "O'Brien's stunning new book of linked stories, The Things They Carried, is about the power of the imagination. . . . I've read all five of O'Brien's books with admiration that sometimes verges on awe. Nobody else can make me feel, as his three Vietnam books have, what I imagine to have been the reality of that war." "I've got to make you read this book. ... A certain panic arises in me. In trying to review a book as precious as The Things They Carried by Tim O'Brien, there is the nightmare fear of saying the wrong thing--of not getting the book's wonder across to you fairly-and of sounding merely zealous, fanatical, and hence to be dismissed. If I can't get you to go out and buy this book, then I've failed you. ... In a world filled too often with numbness, or shifting values, these stories shine in a strange and opposite direction, moving against the flow, illuminating life's wonder, life's tenuousness, life's importance." "O'Brien has unmistakably forged one of the most persuasive works of any kind to arise out of any war." "It's a marvelous and chilling book, and something totally new in fiction. A dramatic redefinition of fiction itself, maybe. It will probably be a bestseller and a movie, and deserves to be. It will be nominated for prizes, but I wonder if any prize will do it justice. Maybe a silver star for telling the truth that never happened, passionately, gracefully." "Throughout, it is incredibly ordinary, human stuff-that's why this book is extra-ordinary. . . . Each story resonates with its predecessors, yet stands alone. The soft blurs with the hard. The gore and terror of Vietnam jungle warfare accumulate into an enormous mass." "Even more than Cacciato, The Things They Carried is virtually impossible to summarize in conventional terms. If anything, it is a better book. . . . The novel is held together by two things: the haunting clarity of O'Brien's prose and the intensity of his focus. . . . O'Brien's stories are like nobody else's. His blend of poetic realism and comic fantasy remains unique. ... In short, critics really can't account for O'Brien at all. At least in part that's because his Vietnam stories are really about the yearning for peace--aimed at human understanding rather than some 'definitive' understanding of the war. . . . Just by imagining stories that never happened, and embroidering upon some that did, O'Brien can bring it all back. He can feel the terror and the sorrow and the crazy, jagged laughter. He can bring the dead back to life. And bring back the dreaming, too." "Brilliant. . . O'Brien again shows his literary stuff. . . . An acutely painful reading experience, this collection should be read as a book and not a mere collection of stories. Not since Kurt Vonnegut's Slaughterhouse Five has the American soldier been portrayed with such poignance and sincerity." "One hell of a book . . . You'll rarely read anything as real as this." 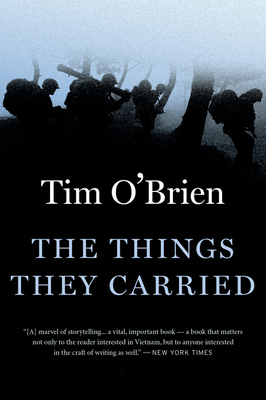 "Tim O'Brien's The Things They Carried carries not only the soldiers' intangible burdens-grief, terror, love, longing--but also the weight of memory, the terrible gravity of guilt. It carries them, though, with a lovely, stirring grace, because it is as much about the redemptive power of stories as it is about Vietnam." "The author of the National Book Award-winning Going After Cacciato offers us fiction in a unique form: a kind of 'faction' presented as a collection of related stories that have the cumulative effect of a unified novel. . . .The prose ranges from staccato soldierly thoughts to raw depictions of violent death to intense personal ruminations by the author that don't appear to be fictional at all. Just when you thought there was nothing left to say about the Vietnam experience . . . there's plenty." "Astonishing . . . Richly wrought and filled with war's paradoxes, The Things They Carried will reward a second, or even a third, reading. . . . His ambitious, modernistic fable, Going After Cacciato, raised the American war novel to new artistic realms. The Things They Carried is also astonishing-in a whole new way." "Eloquent... In The Things They Carried, Tim O'Brien expertly fires off tracer rounds, illuminating the art of war in all its horrible and fascinating complexity, detailing the mad and the mundane. . . . The Things They Carried joins the work of Crane and Hemingway and Mailer as great war literature." "The Things They Carried is distinguished by virtue of the novelty and complexity of its presentation. Mr. O'Brien is a superb prose stylist, perhaps the best among Vietnam War novelists. . . . The imaginative retelling of the war is just as real as the war itself, maybe more so, and experiencing these narratives can be powerfully cathartic for writer and reader alike." "The search for the great American novel will never end, but it gets a step closer to realization with The Things They Carried by Tim O' Brien." "His language is simple--no tricks, no phony subtlety, no 'artistic' twists. The writing is as clear as one of his northern Minnesota lakes. . . . The Things They Carried charts out a lot of emotional territory, gripping the reader from beginning to end. This is one of those books you should read. It is also one of those books you'll be glad you did. . . . This book--and these lives--will live for a long time." "There have been movies. And plays. And books. But there has been nothing like Tim O'Brien's The Things They Carried. . . . O'Brien's vision is unique. . . . All of us, by holding O'Brien's stories in our hands, can approach Vietnam and truth." "His characters and his situations are unique and ring true to the point of tears. His prose is simply magnificent. . . . Unforgettable ." "A powerful yet lyrical work of fiction." "O'Brien's new master work. .. . Go out and get this book and read it. Read it slowly, and let O'Brien's masterful storytelling and his eloquent philosophizing about the nature of war wash over you. . . . The Things They Carried is a major work of literary imagination." "In The Things They Carried, a matchlessly literary book, O'Brien casts away any least pretense and writes straight from the heart. . . . The Things They Carried is an accomplished, gentle, lovely book." "O'Brien's meditations--on war and memory, on darkness and light--suffuse the entire work with a kind of poetic form, making for a highly original, fully realized novel. . . . Beautifully honest . . . The book is persuasive in its desperate hope that stories can save us."